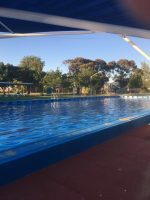 Pyramid Hill Swimming Pool is an outdoor seasonal pool, open from November to March. Opening times; school days 3.30-7pm, school holidays, weekends and public holidays 2-7pm. Opening times may vary due to the temperature.